Drone Usage For Solar Panel Companies | Enaeria Inc. Many Canadians are taking advantage of the financial and environmental benefits of installing solar panels on their roof. With this large increase in demand for solar panel installations, many solar panel companies are popping up to fill the market. This area is becoming a very competitive industry and solar panel companies are now looking to drones to gain a competitive advantage. How can a drone solve this? A drone is used to collect images of the roof instead of sending a worker on the roof. 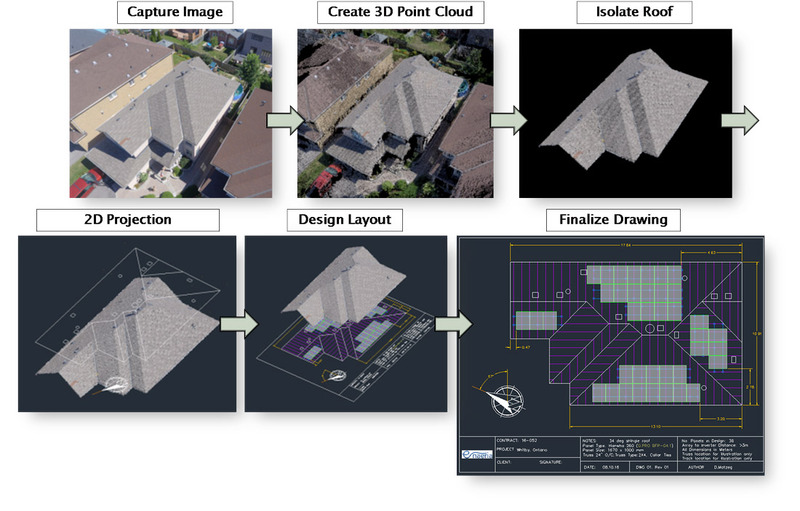 The drone images are used to generate a 3D model of the roof that can easily be used to acquire all the necessary measurements. From here the solar panel companies have all the information they need to ensure the design will bring the most energy without interfering with existing roof features. Drones provide a much safer alternative, and do it in a fraction of the time.